Both Microsoft and Apple were trying skeuomorphic concept for their operation systems. The first company was more global in this case: in March 1995 Microsoft released the whole user interface based on the skeuomorphic concept, called Microsoft Bob. It presented a graphical copy of a room intended for interaction with users. Nevertheless, the project was a great failure of Microsoft. The moral of the story is we shouldn’t overdo. Apple was more modest in their ambitions. And it improved their winning position: developers could concentrate on small elements and bring them to perfection. It’s an interesting fact that Steve Jobs valued skeuomorphism in Apple products so much that he controlled some projects by himself. And for a good reason: for example, classic calculator design served as a basis for Mac OS for 16 years. If you want to get more detailed and more practical info about the subject, I would recommend you to check an interactive infographic about skeuomorphism that is now available at templatemonster.com. The infographic is designed in a vintage style: a wooden shelf background, VHS tapes, postal marks and other design elements will take you to the past. By the way, you’ll have to watch an old-fashioned CRT TV in order to know the top tips about skeuomorphism in web design. Just click on the icon that introduces the information you need and learn what skeuomorphism is, what its pros and cons are and so on. 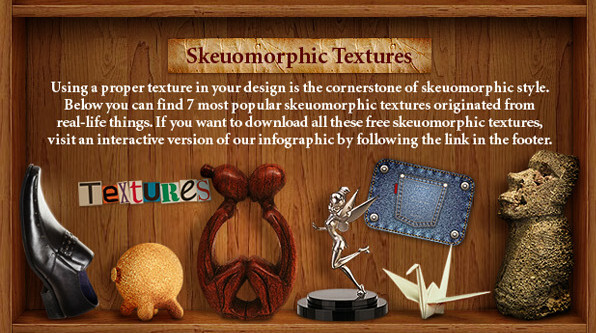 Additionally, you’ll find a lot of free skeuomorphic textures (wood textures, paper textures, leather textures, cork textures, etc) that you can use if you want to follow the skeuomorphic trend when designing web pages. Please click on the screenshot below to see the interactive infographic in action. SEE ALSO: Infographic: Is Your Business Card Social Media Friendly? Art Rivera is deeply interested in everything connected with Internet, he sincerely suppose the web is the only future reality for the humanity through its inevitable involving into every part of human life. And of course someone should make this future look nice: all hail to Web Design, the King of all my web-interests.